Content strategy defines channel strategy — not the other way around. The following guide (source) is intended to help brands understand the steps in developing a winning content marketing strategy. It is a lengthy process that usually takes several months but when implemented correctly can be a driving force behind your marketing impact and sales results. Before thinking about content strategy you must have a clear understanding of the groups of customers your business deals with and the behaviors of the key individuals with you wish to target within each customer segment. In user-centered design and marketing, personas are fictional characters created to represent the different user types that might use a site, brand, or product in a similar way. In most cases, personas are synthesized from data collected from interviews with users. They are captured in 1–2-page descriptions that include behavior patterns, goals, skills, attitudes, and the environment, with a few fictional personal details to make the persona a realistic character. For each product, more than one persona is usually created, but one persona should always be the primary focus for the design or advertising campaign. When brands attempt to speak to multiple personas at the same time, messaging often does not resonate and campaigns are less effective. Boiling your content strategy down to one page is hard. But it works like magic when you need to get and keep executives’ attention. 1 and 2 reflect your understanding and alignment with business needs. Points 3 and 4 guide marketing operations. Points 1 and 3 specify what to do, while 2 and 4 focus on how to measure success. Goals: How will the company measure that? Most compelling to your execs are results that show how content marketing contributes to the business, especially: marketing-qualified leads, sales-accepted leads, sales pipeline, customer wins, revenue, profits. Strategies: What will the department or program do to meet the company objective? If it does not address the needs in points 1 and 2, it’s the wrong strategy. Metrics: How will we measure the success of those strategies? Focus on key measures in addition to the business measures in point 2.One-page plans make expectations crystal-clear for a boss or a client. A one-page plan helps align everyone who’s working on a program or project, internal or external. 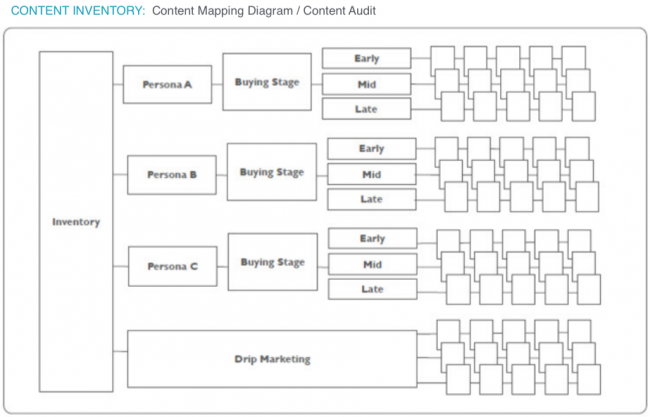 Make message maps the linchpin of your content marketing program. 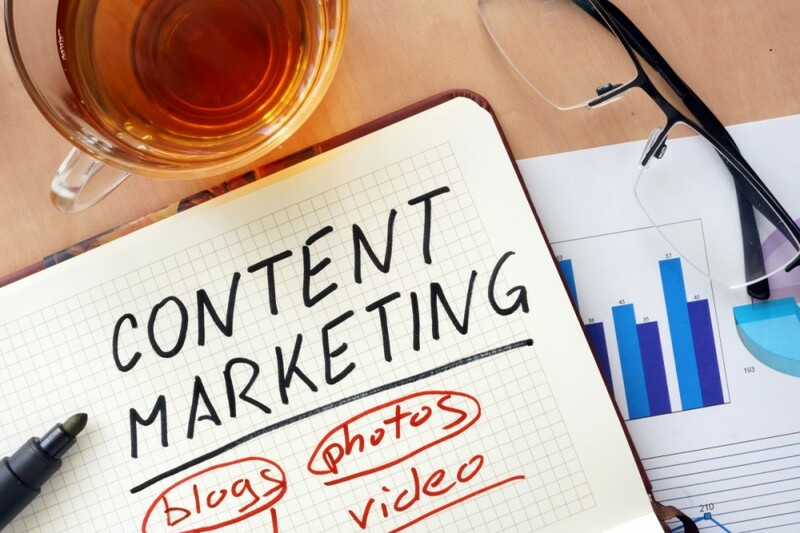 A clear, consistent message in your content marketing wins people over. A message map helps you say it, share it, tweet it, blog it, post it, publish it, or debate it well. Message maps help you display a command of the facts, stay crystal-clear and tell your story well. Most important, when delivered well, message maps make your main message sticky. Convene a workshop that includes the CEO, CFO, CMO, CCO and other C-levels, physically together in the same room. Bring in a neutral facilitator. Focus on: How does the company tell its story today? How could we make the story better tomorrow? Home base, in the center of the map, is the main message. It needs to answer the question, “What’s in it for me?” as seen through the eyes of all stakeholders. One level out from home base are positive points. You need at least 3 points to support the home base message well. Two levels out from home base are positive proof points. These can be examples, quotes from customers or facts and figures. As the map extends out, its content grows more and more granular and quantitative. Each point logically links to the point above it, all the way back to home base. Include differentiating points: What makes your offering different? What can you say that competitors can’t say? These are often the hardest elements to ferret out. Offer an example of a simple message map like the one below. 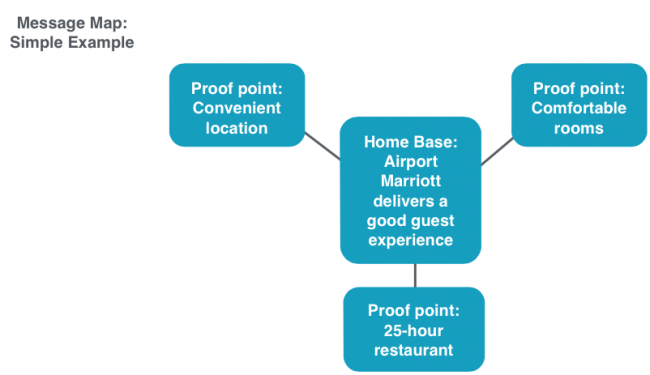 Here’s a 19-word message about the hotel where I stayed last night: The airport Marriott delivers a good guest experience (home base) with a convenient location (positive point), comfortable rooms (positive point) and a 24-hour restaurant (positive point). The average sound bite in news media is about 7 seconds or 23 words. The average American’s attention span is 8 seconds. If you can’t tell your story in 7 seconds, you probably won’t get to tell your story at all. They’re all telling different stories. Sometimes, the stories don’t even sound like they come from the same company. A home base supported by 3 positive points is very powerful. Up to now, they’ve never had a simple tool to help them tell their story. These realizations lead to an intense discussion about which parts of the story work and which don’t. On a white board, a facilitator takes the best parts of each exec’s story and maps out a story co-created by the team. With only 23 words to work with, the execs debate each and every word. Passionately. By the end of the workshop (generally 4 to 8 hours), the execs have co-created a consistent message. On it, you can build all your marketing, communications and investor messages with consistency. Update the map at least quarterly to keep it fresh. Co-creating the message is key. You can use the same process to create the story for a single product or solution. Convene product managers, R&D, sales, marketing and all other relevant participants to co-create a message map. When you co-create the message, everyone shares a stake in its success. With an agreed message map in hand, the next step for content marketers is to color-code them by buyer persona. Why? Economic buyers often don’t care about technical benefits and vice-versa. Don’t waste buyers’ time by telling them the irrelevant facets of your value proposition! What do we already have that helps us tell this story (e.g., an existing website, blog, Facebook page, Twitter account, corporate materials, article marketing effort, etc.)? What must change in order for us to tell this story (e.g., do we need to add a blog, develop a separate blog, create or revisit our social web strategy)? What must stop (if anything) for us to tell this story (e.g., do we need to stop using Facebook and divert our energy to a blog)? Out of this situational analysis will come some prioritization, budget consideration, and more tactical things that need to get done. In the process of an audit, most B2B companies find that their marketing focuses on the company and its products, but not on buyers’ needs. This is where you map objectives of the marketing channels to the engagement cycle (remember these are tightly woven with your ultimate goals). And it’s perfectly okay if a channel only “contributes” to another channel. For example, based on the goals of your content marketing and the story you are telling, you may decide that the primary objective of your Facebook page is to create increased and loyal traffic to your ultimate content (let’s say it’s a blog). In order to drive that traffic, you may need to create a following on Facebook. So your first “objective” for the Facebook page will be to “build your ‘likes’ ” to create that community. This is how you map the channel to the larger story structure. This will usually take the form of an outline or narrative and is used to organize your content for each channel. For example, in the situation described above — because your primary objective for the Facebook page is to increase loyal traffic to your blog, you want to build a community. So the first part of your content plan for Facebook might be a “contest,” email marketing program, or some other type of community-building action to build your Facebook subscription. The second part of the plan might kick in once you’ve reached some “goal” (e.g., conversions, number of subscribers, etc. ); then you’ll begin refocusing your content to drive specific personas to your blog. You can use your imagination to see how this step might be multilayered, as you continue your community building and refocusing of content. You need to consider context here as well. For example, let’s say you’re talking about a “mobile channel” and your channel objective is to build subscribers to your blog or website. And let’s say you post lots of really valuable, long-form content on that blog. Maybe an initial content plan for that “mobile channel” would be to produce a different, shorter, or more mobile-specific category to that channel, knowing that your mobile persona only has time and bandwidth for a very short version of content that they may want to read later. Here, you are fulfilling the “contextual need” of your mobile persona. With as many marketing channels as you already have working, against all the different campaigns — and as your content marketing will inevitably overlap into your marketing channels — metrics are what you want to track here, not marketing KPIs. Looking back at your persona mapping, certainly not every channel will address every persona. So for each channel you are considering, you should identify which personas will be addressed. Once you are done with your channel plan, look at it holistically and make any adjustments that are needed. You may find that you have done a great job of creating a channel plan that fails to address your most critical persona. Whoops. Or, you may find that you’re trying to address too many personas through one particular channel — and it makes better sense to split them. For example, Dell has multiple Twitter accounts used for customer service, discounts and general information. For this stage, you need to ensure that you have a method and process (e.g., people and tools) to manage the content and conversation for this particular channel. What will you manage? Who will do it — and how? Identify the people and resources you have or need. Lastly, you’ll need an editorial plan for your channels. This will map to your global editorial calendar — but doesn’t identify dates or times yet. The purpose of the editorial plan is to define velocity, tone, desired action, and structure for the content for this channel. Your answers to the following questions will help you determine what you need to track in your calendar, as well as help you stay focused on your marketing goals as you plan your content creation. Why you are creating content? Are you looking to generate leads? Increase your thought leadership? Drive attendance to your events? Your content marketing mission and goals will impact what you publish, where you publish, and how often, as well as how your team prioritizes, organizes, and categorizes/tags its content creation efforts. What resources do you have at your disposal? Whether you have a dedicated in-house team of writers and videographers, a stable of industry pros looking to share their insight, or just a handful of reluctant execs who will need some serious content creation hand-holding, the formats, frequency, and overall workflow you track in your calendar will likely depend on who is writing and where their expertise lies. Keywords and other meta-data, such as meta-descriptions and SEO titles (if they differ from your headlines), which will help you keep your SEO efforts aligned with your content creation.